How is Oil and Gas formed? Oil and gas are a blend of hundreds of chemicals called hydrocarbons. They are formed from the remains of microscopic plants and animals. As the animals died their remains drifted to the seabed and mixed with dead plants. Over millions of years the mixture compressed under layers of sediment. The pressure of the water and the layers of sand changed the chemicals within the animal's bodies into hydrocarbons. To reach oil and gas you must drill very deep, nearly two miles in places. Offshore drilling is very difficult. A tall, steel tower called a Derrick is needed to support long sections of pipe. A drill bit is attached to the end of the pipe and is used to bore into the rock. 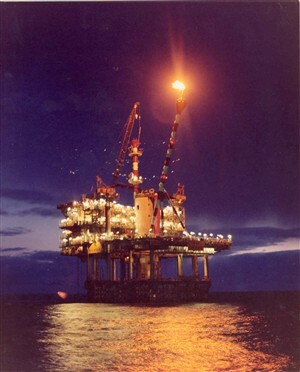 To search for oil and gass offshore the Derrick, pipe and drill bit need to be on a ship or a floating rig. They have to be able to stay even if the sea is rough. The crude oil produced from the field cannot be used as it is. It needs to be split up into many different oil products in an oil refinery. The oil can then be sold as petrol. jet fuel, heating oil or lubricating oil. A major terminal to receive gas was built at Bacton, north of Great Yarmouth in 1968.